We announced last Friday that you could take notes on YouVersion on the web. That same notes feature is now available on BlackBerry! Download version 2.7 now from Blackberry App World. Associate with a verse. Notes are pretty straightforward. When you select a verse and click Notes, you’ll see all of the public notes associated with that passage. To add your own, just click New Note. Make a general note. You don’t have to associate a note with a specific verse. You can take one at any time. Simply go to the dashboard, select Notes, and go! Draft. A note “in progress” that you’re not ready to share yet. Public. Anyone will be able to see this note. Publish on: Schedule the date you want this note to become public. TIP: You can change a note back and forth between private and public at any time. Interact with notes. You can “Share” a note to post it to Twitter or Facebook, “Like” a note to put it in your Facebook newsfeed, or even “Report” a note to flag it as inappropriate content. As we learn how you guys use notes in the Bible App going forward, we’ll continue modifying this feature to make sure it is as helpful as possible. Give it a try and go add some notes on your BlackBerry. 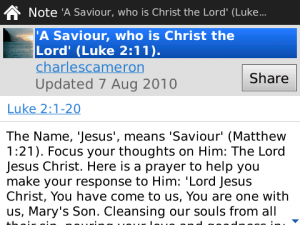 And look for continuing development for the Bible App on BlackBerry over the coming months–cool things are ahead! 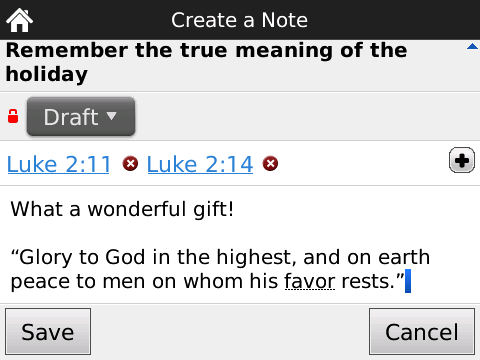 With version 2.5 of the YouVersion Bible app for BlackBerry, we’ve added the ability to bookmark verses for quick access later. Bookmarking is a popular feature on iPhone, iPad, Android and our other mobile apps, and we’re excited to deliver this feature to more than 2 million BlackBerry users. 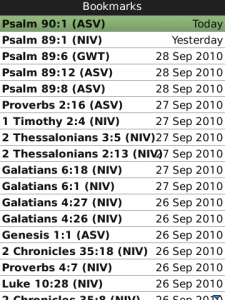 Bookmarking a verse is simple. 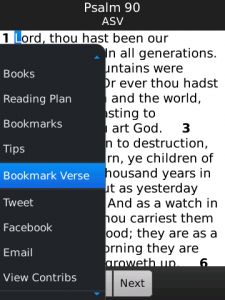 Just select a verse, hit the menu button, and choose “Bookmark Verse” from the menu. 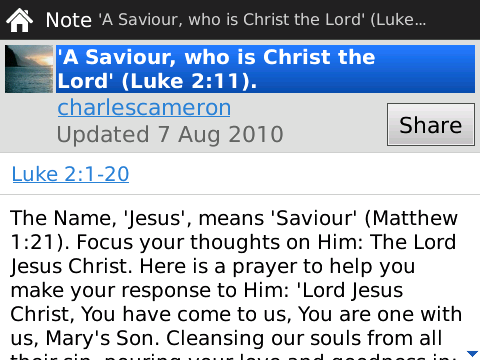 Now that verse will be listed among your bookmarks, which you can reach from the app dashboard. And, since many of our mobile app users also enjoy engaging Scripture on their computer at YouVersion.com, your bookmarks will also sync with your YouVersion account so you’ll have them anywhere you use YouVersion to read the Bible. We have lots of new features coming down the pipeline for all of our mobile apps, so keep an eye out for great updates rolling out fast and furious. You’ll see things like the ability to share Bible verses via SMS (text message) and inside BlackBerry Messenger as well as faster load times and an updated dashboard design. Also on the horizon is a revamp of YouVersion Contributions and Journals. We have big plans for them and can’t wait roll those changes out to you. Of course, that’s all we can say right now, but we know you’ll love the changes and what you’ll be able to do within your Bible app in the coming weeks.